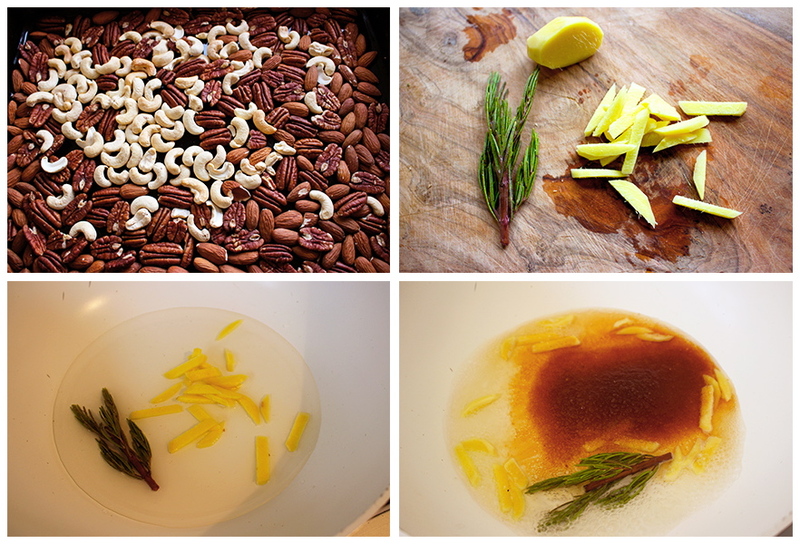 Cooking with Vân : Caramelised mixed nuts with ginger and rosemary( serve 5). 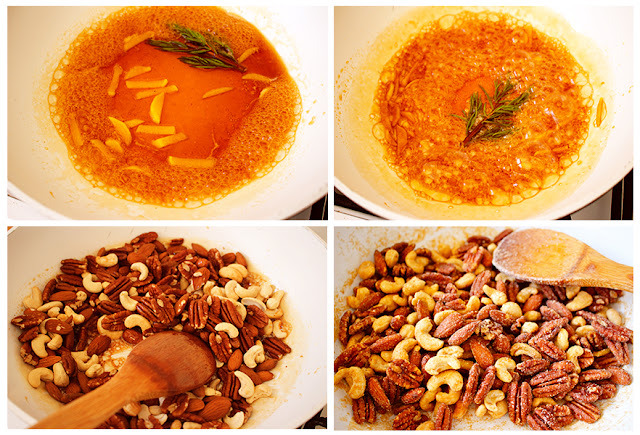 Caramelised mixed nuts with ginger and rosemary( serve 5). Like many Asian I love nuts and the only thing I am allergic to is alcohol. 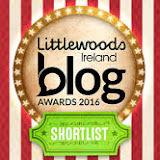 It's the other way round here in Ireland. I only can take one drink, it could be Irish coffee, a cocktail or few sips of beer and I will wake up with a hang over the next day. Only my mum can drink in my family and the rest takes after my dad for that allergy. The most popular nuts are consumed in Asia is peanuts. They are cheap, tasty and could be grown and harvest in big quantity. Cashew nuts are way more expensive as it requires a lot of labour from growing, harvesting, roasting to get the last product is raw peeled cashew nuts. There are many other kind of nuts we enjoy depends on different region and climate. Nuts are widely used in cooking to boost the nutty, rich and savory taste for any dish. Some crunchy toasted cashew/peanuts cannot be missed out for most Asian salad dishes, yoghurt/ porridge topping but, we all know nuts go best with beer. This recipe is one of my favourite one. The nuts could be stored in an airtight jar and I often enjoy them as snack. 3 cups of raw nuts: cashew, almond, pecan(the reason I use those types because they will be roasted nicely at the same time). 3 table spoons brown or palm sugar. Spread the nuts out flatly on a baking tray to make sure they will be cooked evenly. Heat up the oven to 200 Celsius degree. Place the nuts tray in the oven and cook for 2 minutes. 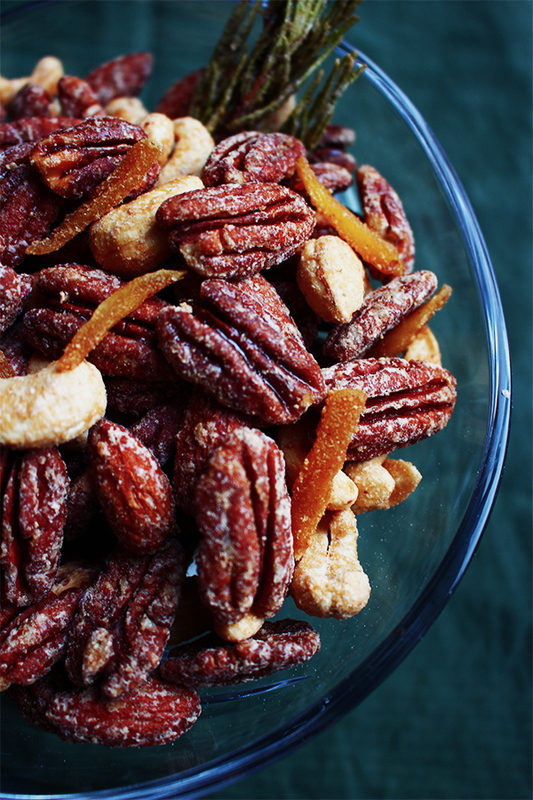 If you like the nuts crunchier you can cook them for extra 1 or 2 minutes. Turn off the oven after 2 minutes and leave the nuts there to be roasted slowly for another 10 minutes. The slow heat will make the nut retains the flavour with a crunchy texture. Chop ginger into small strips. In a frying pan add in 1/4 cup water and bring to boil together with the rose marry and ginger. Boil them for 3 minutes to extract the flavour from the herbs and then add in 3 table spoons brown sugar and a pinch of salt. Bring to boil again to reduce to water( in this step you can add any kind of spice you prefer). After 3 minutes the water had gone and you have this sticky caramel .Quickly add in the nuts and mix well and turn off the heat. Note: if you add the nuts in right before the caramel becomes very sticky then the nuts would be coated in layer of sugar( as in the pic) instead of the sticky caramel. It depends how you want the nuts to be coated, you can control when to add in the nuts. Keep the nuts in an airtight jar and you can keep them for months. It's healthy and heavenly delicious.